TDK Corporation and its companies EPCOS, InvenSense and TDK-Micronas are all set to exhibit their innovative sensor solutions in Las Vegas at CES® 2018 from January 9-12. TDK offers sensors and solutions for mobile, wearable, AR/VR, automotive, Internet of Things (IoT), drone, and industrial applications. TDK’s expanding sensor portfolio covers sensing temperatures, pressures, currents, and magnetic fields, as well as positions, angles, and acceleration rates. The sensor offerings complement TDK’s existing roster of electronic components, modules, and systems (capacitors, inductors, ferrites, and RF products); power supplies; magnetic application products, and flash memory application devices. OEMs are invited to learn about market advancements, developments, design concerns, and new sensor offerings across motion, sound, environment and status. InvenSense Pressure Sensors: The new InvenSense ICP-101XX barometric pressure sensor family is based on MEMS capacitive technology which provides ultra-low noise at the lowest power, enabling industry leading relative accuracy, sensor throughput, and temperature stability. It detects <5cm vertical movement and consumes only 1.3uA, enabling improved drone hovering, activity and air-flow monitoring, and always-on motion sensing. The ICP-101XX measures pressure differences with an accuracy of +/-1Pa, enabling vertical motion measurement differentials of less than a single stair step. Also on display is the InvenSense ICM-20789, the industry’s first 7-axis motion and pressure sensor (3-axis Accel, 3-axis gyro and pressure), for consumer electronic, drone and IoT markets. TDK TMR Angle Sensor: The TAD2141 sensor achieves the industry's highest accuracy of angle error of ±0.05° with guaranteed accuracy of angle error of ±0.2 over its lifetime. This contributes significantly to miniaturization and weight savings, compared to the angle detection method of conventional resolvers. For the first time in North America, the TAD2141 will be demonstrated in a robotic arm, showing its effectiveness in industrial applications. EPCOS Automotive Sensors: High-performance and long-term stable pressure sensing elements are designed for pressure ranges of 100 mbar up to 40 bar. The dies are available with sizes of 0.69 mm x 0.69 mm up to 2 mm x 2 mm. The automotive market benefits from dies with optional gold bond pads for high temperatures up to 170 °C and high corrosion resistance or high burst pressures. InvenSense Motion and Microphones: InvenSense’s robust portfolio of MEMS 3/6/7/9 axis motion sensors are accompanied by the highest performing MEMS audio microphones. CES attendees can see a demonstration of the new ICM-40688, InvenSense’s next-generation MEMS 6-axis integrated inertial device that combines a 3-axis gyroscope and a 3-axis accelerometer. The ICM-40688 significantly outperforms other motion sensors with extended motion range, superior noise performance and temperature stability of accelerator and gyroscope. Micronas Hall-Effect Sensors: Hall sensors enable sensing in both dynamic and static magnetic fields, making them ideal for determining speed, positions and angles in automotive applications. TDK-Micronas has already delivered more than four billion Hall sensors to the automotive and industrial markets. CeraCharge™ Solid-State Batteries: The world’s first rechargeable solid-state SMD battery, TDK’s CeraCharge™ has no liquid electrolyte, and is based on a multilayer ceramic technology, similar to MLCCs, to excel in thermal management, with a wide temperature range from -20 °C to +80 °C. The number of charge/discharge cycles this battery is able to perform ranges from several dozens to up to 1,000. 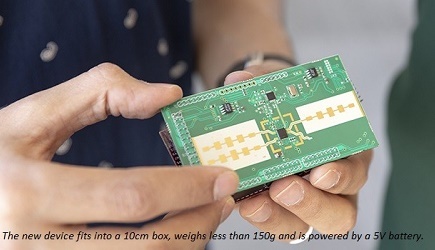 With its compact EIA 1812 package (4.5 x 3.2 x 1.1 mm), it offers a capacity of 100 µAh at a rated voltage of 1.4 V. The compact size enables the battery to be surface mounted and soldered onto circuitry for applications such as IoT and mobile communication devices. Mass production is slated for April 2018. Note: This demonstration can be viewed by invitation only.